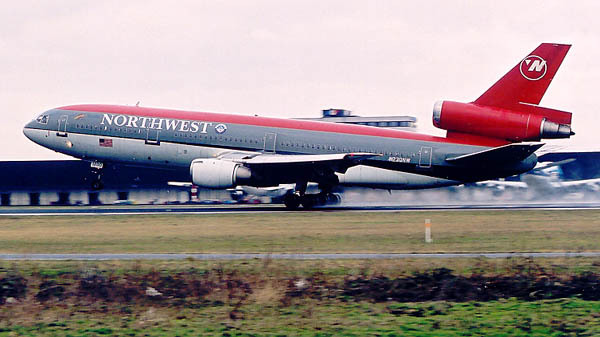 As long as I remember, I think, I have seen Northwest aircraft in this colourscheme; which in fact is not all that long as "NWA" started flying seriously into Amsterdam when KLM and NWA decided on a joint venture. 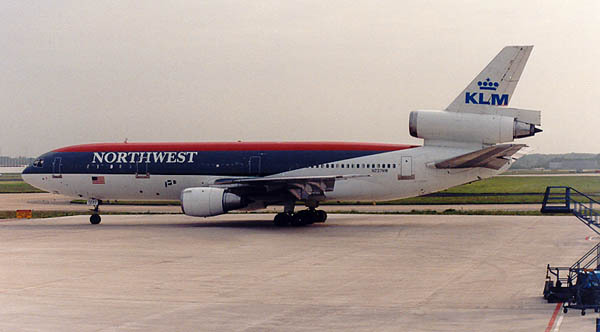 On 02April91 Northwest A/L and KLM Royal Dutch Airlines launched their first joint service, twice-weekly flights between Minneapolis/St. Paul and Amsterdam. Douglas DC-10-30 N230NW (c/n 46552/71) is seen here at Amsterdam IAP, thundering down a moist runway 24 in January 2001. 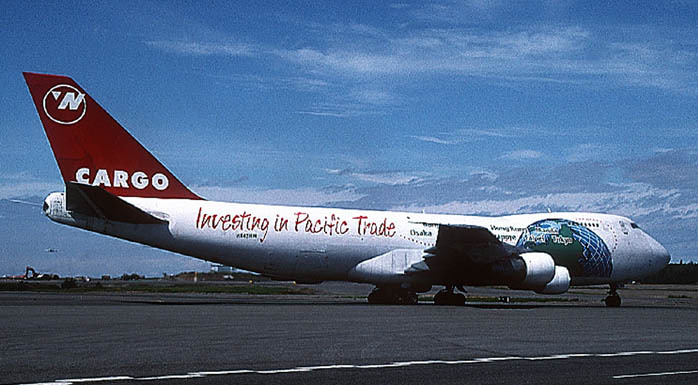 To celebrate the joint-venture this DC-10 N237NW (c/n 47844/336) was painted in a hybrid colourscheme and flew as such for several years. McDonnell-Douglas DC-10-30 N237NW is seen here in May 1999, from the other side; it is parked at Amsterdam's maintenance area, at "Schiphol-East". 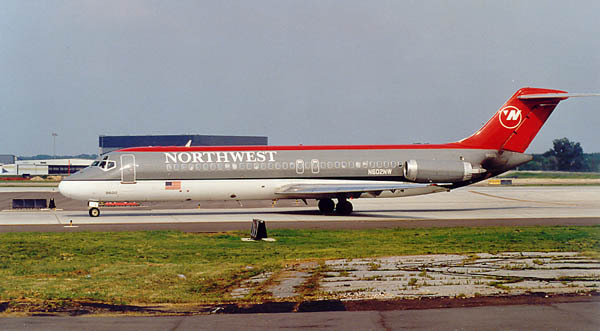 Another McDonnell-Douglas product, the DC-9-32 N602NW (47046/168) is seen here at Memphis IAP, on 02Aug01. The "Worldplane" of NWA ! 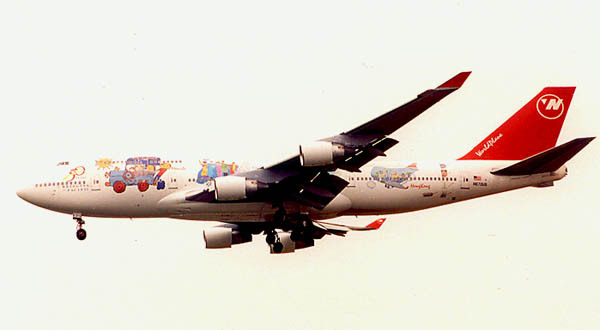 I came across this 747-451 (N670US, 24225/804), full of childlike drawings, on a dreary day at Detroit-DTW in August 1998. I like these sort of initiatives. Boeing 747-251F(SCD) N617US (31121/261) is seen here at Anchorage "Ted Stevens" IAP on 23Jul03. It taxies past a few stored "propliners" to the NWA-ramp and warehouse. Boeing 747-249F(SCD) N643NW (cn 22245/ln 458) at ANC on 23Jul03 too. These colours seem to be the new colours for the cargo fleet, but I confess I never tired of seeing the old colours (but then again, every visit of a NWA cargo plane was a treat at Amsterdam, they rarely made their way to my homebase). The new colours are, in my view, indeed an improvement ! 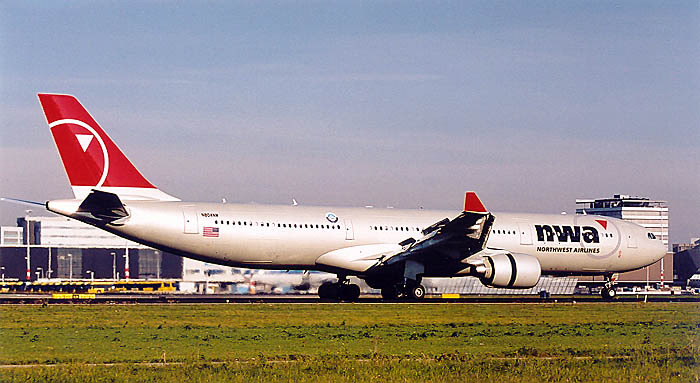 Introduction (2003) coincided with the Airbus A330s replacing the DC-10s. Here is N804NW, an Airbus A330-323 ( c/n 549) landing at Amsterdam's runway "zero-six" on 28Oct03.